Editor's Note:The author of this article, Gary Keen, is with Direct Response Projects, Inc., which is the advertising agency of record for Applied Sweepers, USA. With that noted, what Keen offers is a fine snapshot of what the mini class of sweepers -- a relatively new class of sweepers to the U.S. -- can do. In light of the niche these mini machines fill, it's a good reminder to fleet managers to evaluate how their own sweeper mix might benefit from utilizing the mini class of machines. For many years there have been two basic sizes of outdoor sweepers in the U.S. marketplace, those designed for parking areas and the larger machines used for street sweeping. In recent years, the increase in population, urban congestion and, more recently, rising fuel prices, have created interest in the 'mini' class of sweepers. Rising costs have encouraged many sweeping contractors and municipalities to reassess their sweeping programs. Although the fuel efficiency of the mini machines is widely touted, as this article showcasing the Applied Green Machines brand of mini sweeper shows, there are many other reasons to consider the mini class of sweepers. The smaller sweepers provide far more fuel economy and maneuverability than their full-sized cousins. The emergence of this category of sweepers in the U.S. -- even though they have been in widespread use throughout Europe for many years -- is very much like the growing use of smaller construction vehicles, like Bobcats, that fill a gap between hand work and the traditional behemoths. Another advantage of these new sweepers, good examples being the 525 and 636 Green MachinesTM from Applied Sweepers, is their quiet operation. The low-noise, low-emission, four-cylinder diesel engines permit sweeping during daylight hours. Even in the midst of pedestrians and shoppers these sweepers go quietly about their business, a valuable benefit to shopping center, educational campus and business district managers who believe that the appearance of keeping an area clean is a very important part of their image. The ability to use the machines during the day not only provides a higher level of ongoing cleanliness, but also creates a high 'cleanliness visibility' wherever they are used. Mini sweepers are also ideal for parking lots and multi-level garages. Standing 6'6" tall, the mini sweepers allow contractors and municipalities to take on projects with low ceilings, low overhangs and under shelters where truck-based sweepers cannot fit. Because most full-sized parking area sweepers are too tall to fit into tight spaces like parking garages, some have employed an army of sweeping personnel to keep multi-story garages cleaned. For those situations, mini sweepers are in high demand. They can even sweep inside parking corrals without the need of using hand-held blowers. However, perhaps the most important feature of these mini's is their ability to reach into ninety degree corners with front-mounted fully articulated brushes. These are perennial problem areas for mid-truck sweepers. The corners usually require an assistant or the driver get out of the vehicle and blow leaves into an accessible part of the lot with a back-pack blower. These types of interruptions translate into significant time-consuming delays over the course of a shift. The walk-behind models were initially introduced to the U.S. by Applied Sweepers. Although these are still popular, today's walk-behind sweepers offer ride-on capability, as well. Much attention has been made to the ride-on models ergonomics. They are designed to make the operator as comfortable as possible. However, cab-enclosed mini sweepers offer climate control and a radio/CD player. A comfortable operator means more sweeping time and fewer breaks. Like fuel efficiency, all these benefits add up to a bigger bottom line for contractors and resource savings for our cities and towns. Although the machines are smaller, their payload capacity is actually surprisingly large, in some cases due to innovative features. For example, the four cubic yard capacity Green Machine 525 has a mulching impeller that reduces the bulk of the swept material by a fourth. This 'mulching feature' makes it especially useful in areas where there are a lot of fallen leaves. Because the minis are relatively small and so maneuverable, they offer a whole new freedom and range of sweeping capabilities. Instead of having to walk around with a backpack leaf blower, mini operators can be more effective and yet remain in their climate-controlled cab. To quote one Midwestern contractor when asked how his mini handles leaves: "It does a tremendous job. My mini sweeper actually holds more leaves than my other big machines. We have a mall with a really long sidewalk that goes in between the buildings. It used to stay packed full of leaves and I had to start at one end and blow it all out. Now, I just run the sweeper down once and it's all cleaned. They see that little sweeper all the time (which is a plus). I get the sites a lot cleaner and I can get into places I can't with other sweepers." Green Machines larger model, the 636, in contrast, operates somewhat differently. It is a pure vacuum sweeper outfitted with a massive, oversized clean-fan that vacuums debris and grit directly into its hopper. Dust is kept to a minimum via a fine mist sprayer located in front of the unit. That means no filters to block and great wet-weather performance. Although the pure vacuum system does not compress debris quite as much, it is ideal for picking up sand and grit from curbsides. This makes the 636 an excellent fit for beachside towns and city streets. Another advantage to these machines is their tight turning radii, which make them incredibly agile. For example, Green Machines model 535 can turn in 16 feet, while the slightly larger 636 only requires 21 feet. This is quite a contrast with the 30 feet needed by the average 3-wheel sweeper and the almost 50-foot turning radius needed by some standard parking lot sweepers. Plus, the minis are far easier to steer around flowerbeds, parking islands and between-building alleys. The mini sweeper class also offers features not available in truck-based units. The above examples have standard four-wheel drive, coil-spring suspensions and can travel on surface streets, though not at highway speeds. However, their compact design and light weight make them easily trailered for traveling to distant sites. Although both models have maximum sweeping width of 71 inches, both have minimum width of 45 inches for traveling. With a stainless steel chassis and hopper, the Green Machines are also easy to maintain. For municipalities, the addition of mini sweepers to their fleets have translated to big savings in overall man hours required to do the same job. Because these types of machines are so easy to learn to operate, they are often operated by laborers. This avoids some of the complications that occur with larger equipment. One large city official recently said, "we're not so much replacing larger equipment as we are doing more with the same number employees. The savings occur when expectations for cleaning increase. We are able to respond with more smaller machines and still remain in our budget." Another advantage that might not be immediately apparent: "The people downtown appreciate the work we do and let us park the smaller machines in their lots." And, for the city, that means less fuel used as well as less time traveling to and from the sweeping site. 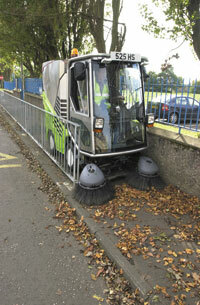 Mini sweepers are able to sweep during the day, even though cars and pedestrians are using the sites during that time. One contractor says, "In the Wal-Mart parking lot, we go right in between cars with our mini. We'll even drive it into the cart corrals. I can pick up the material (that's lodged) in the corners of the curbs. With big sweepers you have to hop out, blow it out and sweep it up. With the Green Machine, we just keep right on moving." That means contracts are renewed and the machines help keep the competition out. With the current trend of higher fuel costs and higher wages, contractors are always looking for more ways to improve profit, gain additional sources of income and, wherever possible, reduce the maintenance expense required with larger equipment. The minis have become, for many contractors, a useful addition to their full-service companies. It allows them to fill the gap between hand blowers, full-sized sweepers and other, larger equipment. And, with employment rules becoming more complicated, if an employer can do all of that then s/he is way out in front of the competition. When one mid-western sweeping contractor was asked what he likes best about his new mini, he replied, "It does what I wanted it to do." That just about says it all. By Gary Keen, Direct Response Projects, Inc. Advertising Agency of Record for Applied Sweepers USA. You may reach Gary via email sent to: Gkeen@DirectResponseProjects.com.